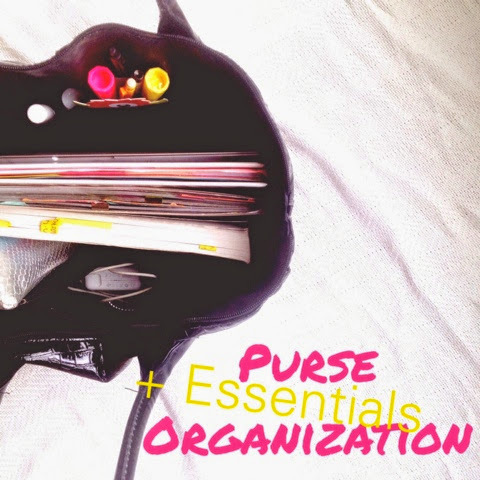 Purses are one of the most important (yet seemingly impossible) things to keep organized. They basically act as a home-away-from-home and hold some of our most valuable, all-important life necessities, such as lipgloss, laptops, and lotion. Now, I will be the first to say that I do NOT have the most organized purse in the world. In fact, I frequently look in it and think “am I just carrying around a portable trash can, or what?” However, I do have a pretty good system for making sure that I have all of the items that I need throughout each day of the week. And with the fall semester right around the corner, maybe this can help you stay put together while running back and forth between classes, dinners, and errands, too! So, what is this system for being prepared for all of the different things I do throughout the week? It’s this: I literally carry a purse within a purse within a purse. Well, technically, it’s a wallet within a clutch within a tote bag, but that just doesn’t sound as good. And "purse within a purse within a purse" is very Inception-esque. During the week, I carry around a giant bag that holds all of my school/teaching supplies. My laptop, chargers, textbooks, writing utensils, etc. I also keep scissors, a baby stapler ($3 from Target) and extra staples (pink, of course. completely necessary, for obvious reasons) (also from Target) for office-supply emergencies. I keep my more traditional "purse" items in a small clutch. This way, if I'm running out for sushi or a quick trip to the grocery store (just kidding, I meant to say Target) in the evening, I can just grab my clutch and know that I can do all the necessary things: pay for things, identify myself, and put on my makeup! When I get home, I just toss it back into the tote bag and I'm all ready for the morning! And on weekend mornings, if I'm just walking to the coffee shop or the park, all I need to do is grab my keys! In my little ID holder, I keep my Cards, Cash, Chapstick, Flash Drive (not pictured because I left it in the computer at FedEx Office it mysteriously disappeared), ID, and Listerie Strips! 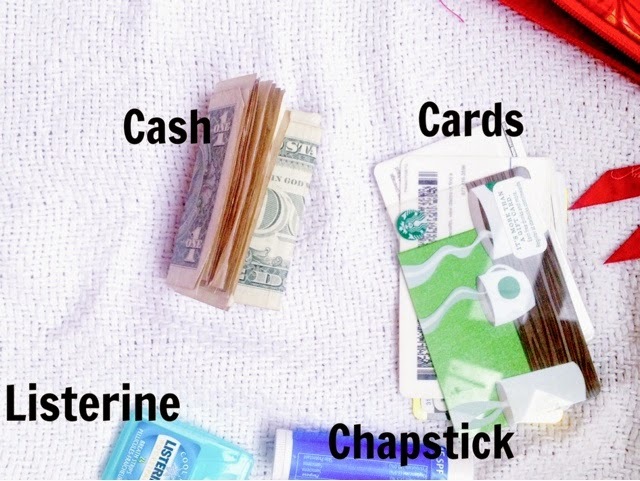 These are the ultimate necessities that I would never be caught without (on purpose, at least). 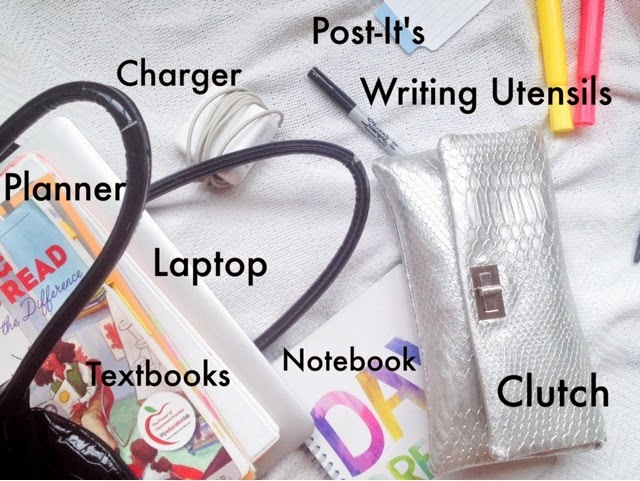 How do you keep your stuff organized throughought the week? 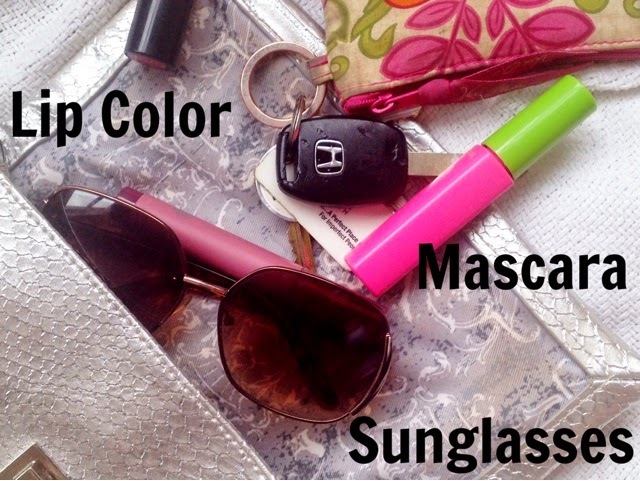 What are some essentials that you would *never* leave the house without? !